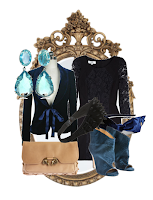 ECLECTIC À LA MODE | style blog: STYLE ADVICE//AT THE PARTY - MINIS AND BLAZERS? STYLE ADVICE//AT THE PARTY - MINIS AND BLAZERS? Holiday parties are coming up in a flurry! Deciding what to wear, especially if you are attending multiple soirees on multiple nights, can be a little frustrating. Here's a few tidbits to keep your mind out of a boggle. I've been asked what to make of minis and jackets... a do or a don't... and is it cool for the holiday party? My personal hunger for showing some leg and my vicious love for blazers says YES! It would be really cute, and if done right for the occasion (a.k.a. let's not expose too much to the office co-workers, considering that you see them the rest of the year when you are all - assumedly - sober) can make a classic impression with stylish holiday twist.